Can you tell that I’m on a cranberry kick? After making cranberry sauce for the first time, I became completely enamored with using fresh cranberries in my cooking. I love the way they pop open and I love their ruby-red color and I love how they get all thick and gelatinous after cooking for a while. Since cranberries won’t be in season for much longer, I figured I better make the most of it and come up with another cranberry recipe. And since the grocery store had bags full of gorgeous looking Mandarin oranges on sale when I was hunting for my cranberries, I thought I’d throw some of those in too. The cornmeal crepe part of this recipe is from Vegetarian Times’ Sweet Cornmeal Crepes with Fresh Blueberries. I made them over the summer when blueberries were cheap and plentiful and I loved them because they were the first crepes I made that didn’t tear or burn or turn out to be a disaster in some way or another. So when I decided to do a cranberry sauce for crepes, this seemed like the perfect crepe recipe to use. Unfortunately, I didn’t have as much luck this time as I did the first time–I couldn’t get a single crepe to flip over without tearing. My husband insisted on taking over and, knowing his record with pancakes, I didn’t expect much, but he was able to get all of his crepes to stay intact. I guess I know who will be making the crepes in our household from now on. Anyway! These cornmeal crepes are more substantive than typical wheat crepes and they have a sweet, citrusy flavor that contrasts nicely with the slightly-sour cranberry sauce. You can make each component of this recipe ahead of time and heat them up in the morning for an easy breakfast. 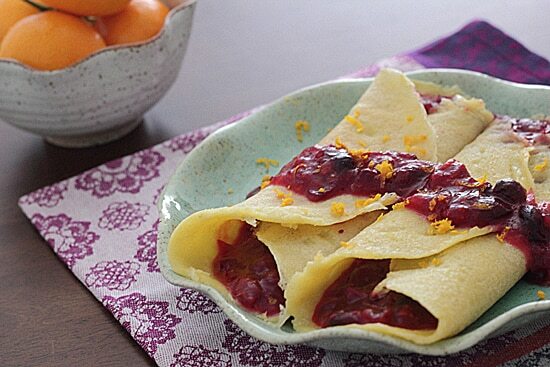 This recipe pairs sweet cornmeal crepes with a tart mandarin cranberry sauce. A perfect weekend breakfast! Sauce: Combine all ingredients in medium saucepan over high heat. Heat until cranberries burst, about 5 minutes, stirring constantly. Reduce heat to medium and continue to cook, stirring frequently, until sauce thickens, about 10 minutes. Crepes: Whisk together flour, cornmeal, sugar, lemon zest and salt in a large bowl. Whisk in eggs and then add milk 1/2 cup at a time, whisking until batter is smooth. Whisk in vanilla. Cover and chill 30 minutes or overnight. Preheat oven to 200 degrees if serving right away. Whisk 1/4 c. water into batter to thin. Lightly grease 9-inch nonstick skillet with canola oil. Heat skillet over medium-high heat. Pour 1/4 cup batter into hot skillet, lifting and turning pan to coat bottom of pan. Cook 1-2 minutes or until edges begin to brown and center is dry. Flip and cook 30 seconds to 1 minute more. Transfer crepe to plate and place in warm oven. Repeat with remaining batter, adding more oil to pan when needed. To serve: Place crepes on plate and fill with cranberry sauce. Fold sides of crepes over filling and drizzle sauce on top. Garnish with Mandarin zest, if desired. omg I love crapes!! Dessert ones are the best! Me too, I just wish I was better at making them! I’ve never made crepes before. These sound divine! Funny, I just saw a recipe a lot like this one but with cherry sauce (not remembering where I saw it!). I love the use of cranberries in this version. Lovely looking recipe. Thanks for sharing. Oh, this would be great with cherries! And it would still work for this time of year, because I think frozen cherries would be perfect for making the sauce. Your food photos make everything look mouth watering! Then reading the recipe really makes me hungry! Thanks for sharing. I love trying new things. They look amazing! I love that combo, the cranberries with the cornmeal! Never had a cornmeal crepe, I’ll have to give it a try! Cornmeal crepes are now my favorite kind of crepes! These are sweet, but I want to experiment with savory ones next. I wouldn’t have thought of cranberry on crepes, but that WORKS! It really does! Especially with sweeter crepes–these have enough sugar in them to counterbalance the tartness of the cranberries. What a great twist on Crepes! Honey, these look wonderful! I’ve always been afraid to make crepes but your recipe looks great! I love using fresh cranberries – my fave is a banana nut cranberry bread, and a fresh orange and cranberry relish. Okay, I need to try that bread! Although the big cranberry container was gone when I was at the grocery store this week–maybe they are out of season now? Thanks! Of course, the ones in the picture are the ones my husband made. 🙂 Mine all ended up tearing or folding over on each other while I flipped them! I almost signed up for a crepe making class recently. These look delish! Yeah, I probably need that. For some reason, I lost all of my crepe-flipping skills! we tried this once all together for a french project,,let me just say it didn’t look like yours! Me too! It took me years to finally make them. The cornmeal ones are easier to deal with because they’re a little bit thicker than flour ones. I’m surprised you had problems with ordinary crepes–did you let the batter rest for 15-30 minutes? That’s a really important step in order to let the flour fully absorb the moisture. I’ve never had issues with wheat based crepes, but found this cornmeal recipe to be more fragile–delicious, but a little tricky.